A lot of families avoid getting a pool installed, despite constant begging and whining from the kids, simply due to the costs involved. You might have the space, you might know you and your family are absolutely going to love a pool, but you also know that pools are money guzzlers – well at least that’s what you’ve heard. The thing is though, that pools don’t have to be that expensive, and if you just follow a few simple steps, the maintenance costs of your pool will be significantly decreased! This one should be a no brainer, but a lot of people like to cut costs when installing their pool by not having a roll out pool cover installed as well. Some consider them a bit of an eyesore, but they are an absolute essential when it comes to keeping the maintenance costs of your pool down. Pool covers do loads of amazing things for your pool. They prevent evaporation so you’re not always topping up, keep your pool warm when you’re not using it to lower heating costs, and keep bugs, leaves and other nasty bits out, saving you cleaning time and money! A little bit of TLC is the best way to keep chemical and cleaning costs down! Even when you’re not using your pool, it’s important to check the chemical and PH balance every couple of days, and top up the chemicals when required. It may be the middle of winter, and you may not be planning on using your pool in months, but the cost of replacing your pool water or even getting a professional in to fix the chemical balance of your water will far outweigh the costs of using a little bit of product here and there throughout the year. Most energy companies have an off peak time where electricity is significantly cheaper to use depending on your contract and your area. If you do have access to an off peak time, this is always the best time to run your pool filter. Most filters do guzzle up energy and can give your electricity bill a big spike when you’re using it, so running it over night during an off peak time will save you valuable dollars. Pretty simple, but something we often forget, particularly when you’re teenagers have been using the pool during the day! If no ones in the pool, make sure everything is turned off – unless you’re running the filter of course! Generally, the heating, jets and pumps don’t need to be running when you’re not in the pool, so switch them off and save significantly on your electricity bill! 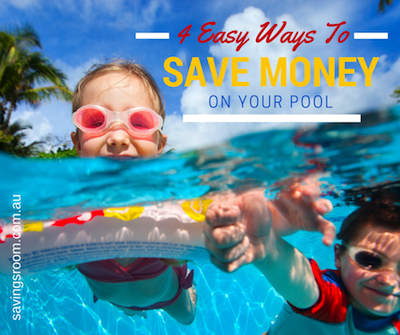 Now that you’ve got these few extra tips in your money saving tool belt, you and your family can enjoy your pool without the feelings of guilt that you may be over spending. And remember – by having a pool, your family can enjoy a “summer’s day out” from home, while getting fit and active without having to step outside your gate. This article has been supplied by the Australian Outdoor Living Pool Shop, Australia’s dedicated online store to everything you need for your pool.